ChildChild age: 3-12 years. Under 3 ride free. 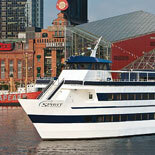 A Baltimore Gospel Lunch Cruise is a wonderful opportunity to experience stirring music and the remarkable views of the Charm City's skyline. 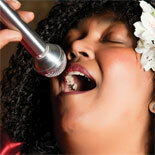 You can hear hymns, spirituals and modern favorites from a talented gospel choir while enjoying a grand buffet lunch. 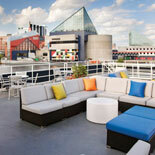 This unique inspirational excursion around Baltimore's famous Inner Harbor enables passengers to enjoy a sumptuous buffet and refreshing drinks as they relax to the sounds of live gospel entertainment as well as a mix of moving music provided by professional DJs. Guests will also enjoy the awe-inspiring view of the cityscape and the well-known historic attractions that encompass the harbor. The newly renovated Spirit of Baltimore has two fully enclosed, climate-controlled decks with panoramic windows that enable the ship to host cruises year round. You can also go topside to enjoy the refreshing breeze and sun on the spacious observation deck. Climb aboard at the Inner Harbor dock near the Baltimore Visitor Center on Light Street for a vibrant and festive combination of good food, lively entertainment and breathtaking views. 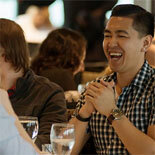 In addition to a wonderful lunch break, the cruise can be part of a special occasion for youth groups, church fellowships, singles mixers and fundraisers. 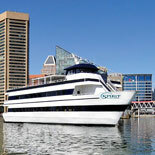 Make your reservations today and obtain the eTicket that will save a place for you on our next exhilarating Baltimore Gospel Lunch Cruise around the majestic Inner Harbor. Ticket Booth is located at 561 Light St (between the new Visitor's Center and the Maryland Science Center). Booth is open 9:00 am until 5:00 pm Mon through Fri | Sat and Sun hours begin at 10:00 am. Booth is open until 7:00 pm on cruise days. Between Light St and E Lee St.
Child age: 3-12 years. Under 3 ride free. Appropriate attire is casual, but no T-shirts, jeans, shorts, flip-flops or sneakers are allowed. Dress code is enforced. A keepsake photo of you and your party will be taken upon boarding. You can decide to purchase or not when you dock. Handicap friendly.